The Practicing Witch has quite the full closet of tools and materials, with skeletons ideally not included. Some of these instruments, such as the Essential Oils and black-hilted knife, have great utility, while others hold more of a symbolic value. Between all of these, the most misunderstood tool is the Bell. Let alone its significance within the Wiccan Faith, the Bell has great significance in many different cultures and religions. It is one of the oldest representational and functional apparatus known to human civilization, and even before any true society was formed! In fact, there has been evidence of man using bells during the Copper Age - over 5,000 years ago! 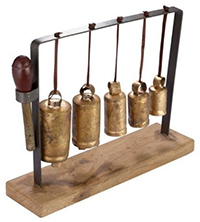 The oldest known use of bells come from ancient China in approximately 3900 B.C.E. Though its direct use cannot be certain, this was a time when humans first began a transition from creating stone tools to metal ones, and the creation of a bell as one of these first metal tools must mean that it had great significance to our ancestors. Since this time, bells have become very widespread, both for practical use and for representation in all different areas of the world. Here are a select few examples, though by no means constitutes all of the possible uses of this key tool. 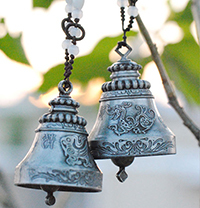 In the Buddhist Faith, small bells are hung upon the rafters of the Temples to communicate with the Heavenly voices. Siberian Shamans wear bells when making prophecies or performing incantations. It is believed that these bells were the voices of the gods, communicating through the Shaman. Individuals of the Catholic Faith often ring bells during their offerings of bread and wine. Church bells were also rung during a time of great importance, or during a thunderstorm. Morris Dancers in Great Britain often wore leggings with many small bells attached while they danced over newly plowed fields to ensure good crops. Beyond these, there are associations with bells that transcend any one particular culture. Many believe that hanging a bell over an infant's crib will protect the child from ghosts and demons. Another belief is that bells hanging over a doorway to a home or another location would protect the inhabitants from evil influences, and a bell hung upon the corner of a pagoda would drive away all negativity from the area, and could even ease an individual's pain. As you can see, there are a great variety of uses of the Bell. They can issue a warning, provide protection, connect with the heavens, among many other applications. Did you know that the largest bell ever created is still standing? Known as the Czar Kolokol, the bell, which now rests safely upon on platform in the Kremlin in Moscow, Russia. It weighs over 2,000 tons (4 million pounds) and stands almost 20 feet tall. It has also never been rung, but could you imagine the great vibrations if it was? Wonderful read! I use bells in all my rituals as the vibrations dispel unwanted energies from a specific area. I also rely on their vibrations when someone is about to enter my home. The specific vibration will alert me as to friend or foe. Hanging bells on your front door knob (inside the house) is always good but you can really place them wherever you would like them or want a bit of extra protection. WHAT A GREAT HISTORY ON BELLS...SOMETHING I DIDN'T KNOW BEFORE.